Over the past couple weeks, we've been talking a lot about sea creatures during our sessions, so I put together this easy sea creature bin. I used crinkle cut paper shreds for the "sea", added some of these Marvel Education Co. Sea Animals that I bought years ago at US Toy, along with some other sea creatures that I picked up at the dollar store. 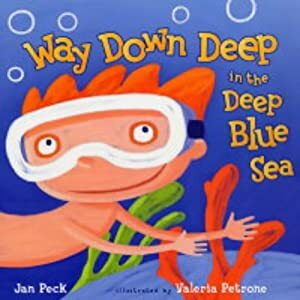 We first read the book Way Down Deep in the Deep Blue Sea by Jan Peck, then took turns "catching" animals out of the bin. We talked about each animal, and then matched them with the pictures in the book. Please leave me a comment below and let me know how you use this activity during speech sessions or at home with your own kids!